Spring buds anew. Feathery snow blankets Lake Saint-Pierre (in the center of Quebec province, Lake Saint-Pierre is the Saint-Lawrence River spilling over its banks onto the surrounding plain) at the end of March, flooding the plain with never-ending cacophony. The Snow Geese, back from their winter home, stop here at Baie-du-Febvre to rest on their way north. Before spring hunting came, hundreds of thousands of geese used to fill the sky, answering the call of warmer days. Now scattered, they share the cornfields with the passionate song of Horned Lark and Killdeer. 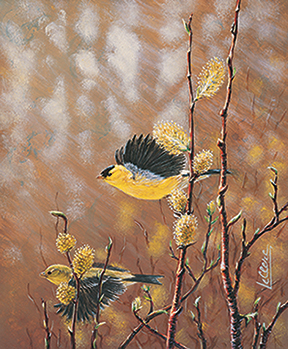 As for the male American Goldfinch, brashly dressed in the colours of the sun, it too has begun to whistle its tumbling summer serenade. The Canada Goose, paired faithfully for life, arrive in great numbers, loudly celebrating their homecoming. As for the Canvasback, he scarcely graces us with his presence on the shoreline. In the marshes or basins, Pintail, American Widgeon, Mallard, Black and Wood Duck swim along as the Ring-necked Duck paddles about and the Bufflehead performs his dance upon the water. All around, blackbirds puff up red wings to proclaim their nesting territories. Later in the season, the buzzing of insects coincides with the early appearance of the Yellow-rumped Warbler arriving in time to taste the sweet sap of maples. In May, the thrush-like Ovenbird walks the forest floor ardently singing louder than the rest. Finally the Canada Warbler has spotted its hunting perch and is keen on putting all its eggs in the nest before summer’s rebirth. And so, the life perpetual’s cycle has written another chapter in a budding anew season and Spring is definitely back!